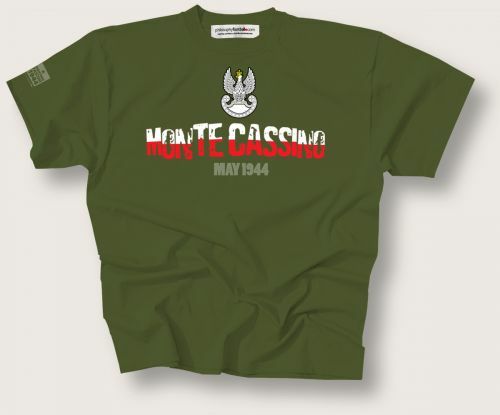 16 May '44 the Polish 2nd Corps launch one of the final assaults on the German defence of Monte Cassino. Two days later this most bloody battle is won, the Polish flag, followed by the Union Jack is raised. By June Rome is liberated from the Nazis too and within a a year following a general uprising by Italian Partisans all of Italy is free of Mussolini and his ally Hitler. Our design features the cap badge of the Polish 2nd Corps and their most epic battle honour in the colours of the Polish flag. Available in unisex sizes small (36inch chest/90cms), medium (40inch/100cms), large (44inch/110cms), XL (48inch/120cms) and XXL (52 inch/130cms).